India's young Grandmaster Parimarjan Negi finished tied first with 10 others and shared the prize money of $43,000 at the World Open Chess in Arlington, Virginia. According to information reaching here, another Indian Grandmaster, Magesh Panchanathan finished 11th in the tournament that concluded Sunday. The 41st Annual World Open was held from June 29-July 7, 2013, at the Hyatt Regency Crystal City, 2799 Jefferson Davis Highway, Arlington, Virginia. World Open 2013 had a very close and exciting finish Sunday morning with a 10-way tie for the first place in the Open Section. It was the second time that Negi was jointly declared the winner. Earlier this week, Negi won the DC Open title by scoring 7.5/9, clearly half point ahead of his nearest rival at the same venue. The full list of GMs who tied for first at the 2013 World Open include: GM Lazaro Bruzon, of Cuba; GM Viktor Laznicka, of the Czech Republic; GM Tamaz Gelashvili, of Georgia (the country); GM Varuzhan Akobian, of Kansas; GM Quesada Yunieski, of Cuba; GM Sergey Erenburg, of Pennsylvania; GM Parimarjan Negi, of India; GM Alejandro Ramirez, of Texas; and GM Yury Shulman, of Illinois. GM Akobian earned the title of World Open champion in a Armageddon game victory over GM Yunieski, in which Akobian had black and draw odds but Yunieski had a 5 to 3 minute time advantage. The tiebreak was played between the two GMs with the best tiebreak score. 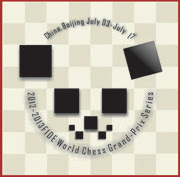 FIDE and Chinese Chess Association are pleased to announce the fifth stage of the FIDE Grand Prix Series will be held in Beijing (China) between the 3rd and 17th of July 2013. New Century Grand Hotel will host the players and the playing venue will be at the premises of the Chinese Chess Association. 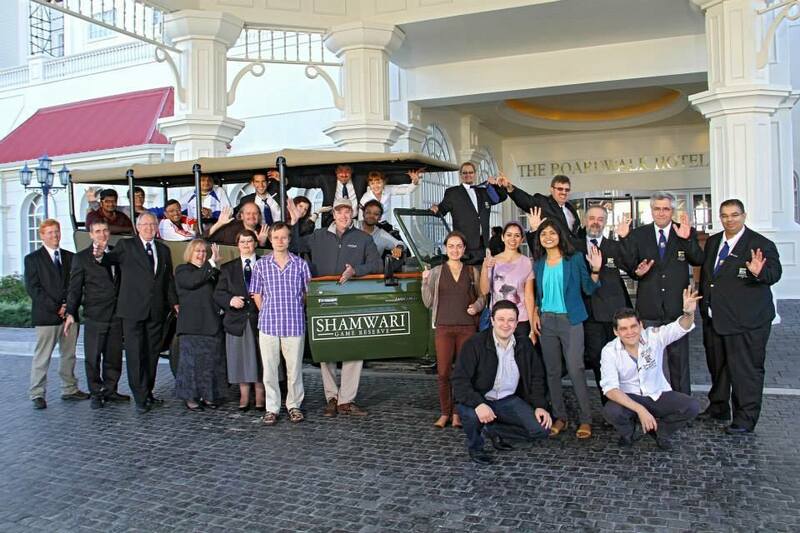 The opening ceremony will take place at the New Century Grand Hotel at 8 p.m. on the 3rd of July. The games start at 3 p.m. local time except the last round. The prize fund to be shared by the players in Beijing is 170,000 EUR, while a further 70,000 EUR is being provided to the accumulated prize fund for the overall Grand Prix series standings. The players' list in Beijing is impressive with former World Champion Veselin Topalov trying to repeat his performance in Zug, Switzerland earlier this year and clinching one of the two places for the forthcoming Candidates tournament in 2014. He will be challenged by several world class players. Boris Gelfand, coming hot from his recent epic victory in Moscow Tal memorial will be one of the prime challengers as will be Shakhriyar Mamedyarov who has had a very good month of June starting with winning the world Rapid Championship in Khanty Mansiysk. Also not to forget world top ten players such as Sergey Karjakin, Alexander Grischuk as well as former Candidates players Vasily Ivanchuk, Peter Leko. GM Teimur Radjabov has withdrawn from the Beijing Grand Prix for personal reasons and has been replaced by GM Wang Yue from China. The top Chinese player Wang Hao, who placed fourth in overall Grand Prix at the moment, will also play in Beijing. There will be a systematic renewal of images, reports and press-conferences with the players on the official page of the tournament: beijing2013.fide.com. The Grand Prix Series consists of six tournaments to be held over two years (2012-2013). 18 top players participate in 4 of these 6 tournaments. The winner and second placed player overall of the Grand Prix Series will qualify for the Candidates Tournament to be held in March 2014. 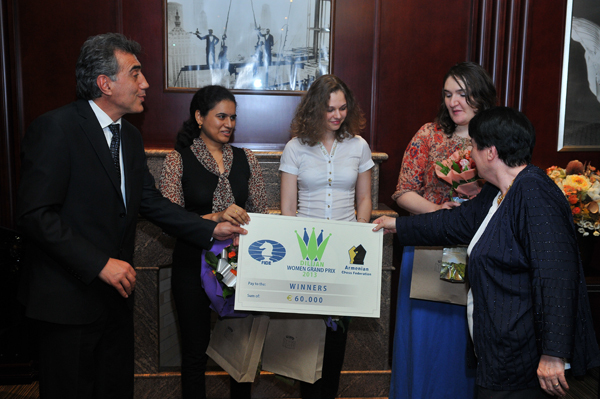 India's chess pride Grandmaster Koneru Humpy has won the FIDE Women’s Chess Grand Prix in Dilijan, Armenia, this Friday. She finished the tournament with a fantastic performance even piccking up a win in the final round against Mongolia’s Tuvshintugs Batchimeg. The top seed from Vijayawada scored eight points from 11 rounds which was a full point ahead of Slovenia’s Anna Muzychuk, the second seed, and Nana Dzagnidze of Georgia. 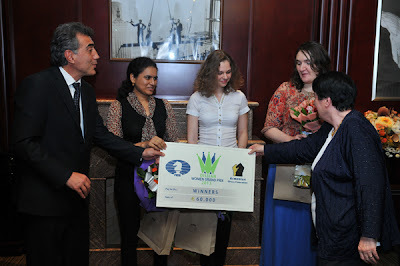 Humpy was the only unbeaten player in the field that contained 12 of the top women chess players in the world. The other Indian chess player who attended the tournament, D. Harika, played well and finished with five points and tied for the sixth place, after drawing with former World Chess Champion Antoaneta Stefanova of Bulgaria. The FIDE Grand Prix is a six-part series that will determine the challenger for the 2015 Women’s World Chess Championship. 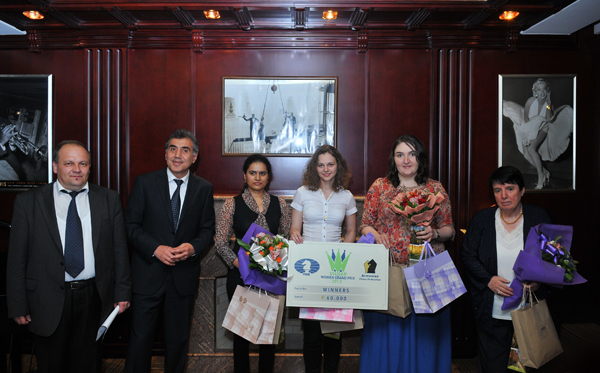 Koneru Humpy's victory at the Dilijan Chess Grand Prix included draw with D Harika, win over Elina Danielian, draw with Anna Ushenina, win over Tatiana Kosintseva, draw with Bela Khotenashvili, win over Anna Muzychuk, win over Anna Stefanova, draw with Viktorija Cmilyte, draw with Nana Dzagnidze, draw with Olga Girya and a win over Batchimeg Tuvshintugs. The standings: 1. Humpy 8; 2-3. Muzychuk and Dzagnidze 7; 4. Kosintseva 6; 5. Ushenina 5.5; 6-8. Stefanova, Batchimeg & Harika 5; 9-11.Girya, Cmylite & Danielian 4.5; 12. Khotenashvili 4. World champion Viswanathan Anand ended his campaign with an easy draw against Sergey Karjaikin of Russia in the ninth and final round of Tal Memorial Chess tournament that concluded here. Boris Gelfand of Israel, who had lost to Anand in the last World championship match, deservingly won the tournament after signing peace with Vladimir Kramnik of Russia in the final round. Gelfand finished with six points in all and remained a half point ahead of World number one Magnus Carlsen of Norway who ended on 5.5 points following a last round draw against Shakhriyar Mamedyarov of Azerbaijan. Mamedyarov and Dmitry Andreikin of Russia and Fabiano Caruana of Italy finished tied third on five points, a half point ahead of Hikaru Nakamura of United States who succumbed to his third straight loss in the tournament after losing the final game against Alexander Morozevich of Russia. Karjakin finished seventh on four points while Anand and Morozevich are tied for the eighth spot on 3.5 points each. Kramnik ended a disappointing last on just three points. The last round was devoid of much excitement for obvious reasons. Kramnik just wanted to finish the tournament and did not do much with white against Gelfand who secured an easy draw. With black, Anand too did not have to sweat much against Karjakin out of a Sicilian Najdorf that was drawn early. Carlsen wanted to catch up with Gelfand at the top but he was lucky in fact to come out unscathed against Mamedyarov who played an enterprising game with white. Carlsen had to solve some tactical problems in the middle game and technical problems in the endgame to split the point. 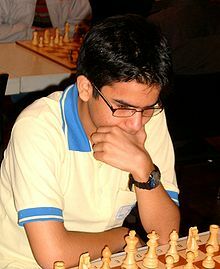 Nakamura had beaten Anand in the sixth round but his luck apparently deserted him thereafter. In the seventh round he had lost to Gelfand, in the eighth Carlsen had proved stronger while in the final round Alexander Morozevich scored his first victory in the tournament at the expense of the American. For Anand the bad showing here is going to reflect on his rating. With 2774 points after the outing here, Anand finds himself on seventh spot in world rankings. 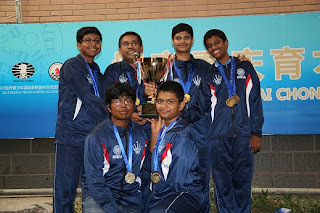 For the records, Anand lost three games, won one and drew the remaining five. Kramnik was in similar shoes and lost three and drew six.